We offer FREE DELIVERY on all orders for delivery to a mainland UK address. Give us your mobile number when you checkout to receive a 1 hour delivery slot by text message on the day of delivery! FREE DELIVERY is for shipments to a mainland UK address, on a next working day service. We can also deliver on a Saturday at a cost of £18.00. For all other destinations please call our freephone helpline on 0808 169 1505 or email sales@theceilingfancompany.co.uk for a quotation. UK Mainland excludes the Channel Islands, Northern Ireland, Isle of Man and the following postcodes: AB31-38, AB40-56, IV1-28, IV1-28, IV30-32, IV36-49, IV51-56, IV63, KA27-28, KW1-14, KW15-17, PA20-38, PA41-49, PH4-44, PH49-50, HS, IM, JE, GY, ZE. Our standard delivery service is next working day for all orders received by midday. Saturday deliveries are also available at a cost of £18.00. If you have not received your order after 3 working days then please call the customer services team on our freephone helpline 0808 169 1505 or email us at sales@theceilingfancompany.co.uk and we will investigate for you. We accept all major credit cards such as Mastercard, Visa, Maestro, Switch, Solo, Delta and Visa Electron. You can also pay via PayPal. What happens if no one is at home to accept delivery? If no one is available to take delivery from our couriers, a calling card will be left. If you do not contact the courier, one further delivery attempt will be made. If the courier is still unable to deliver after this point then the goods will be returned to us. Please note you are required to examine your goods at point of delivery and sign 'received in good condition', if signed for in good condition we will subsequently not refund or pay for collection of damaged goods. What if my package is damaged in transit? If the package is damaged please sign delivery paperwork 'accepted package damaged' or if you so wish refuse the delivery. If you require re-delivery, TheCeilingFanCompany reserves the right to charge these additional shipping costs. Should you wish to cancel the order at this point, we reserve the right to deduct from any refund the cost of the initial delivery charge plus extraneous costs incurred as a result of the goods being returned to TheCeilingFanCompany. Damaged or faulty goods will be replaced or refunded. Damaged or broken glass does not constitute faulty goods, although damaged glass will be replaced. You must notify TheCeilingFanCompany within 7 days of receipt (see returns policy). TheCeilingFanCompany take no responsibility for any consequential loss or cost incurred due to faulty goods or shortages such as electrician fees, time taken from place of employment etc. 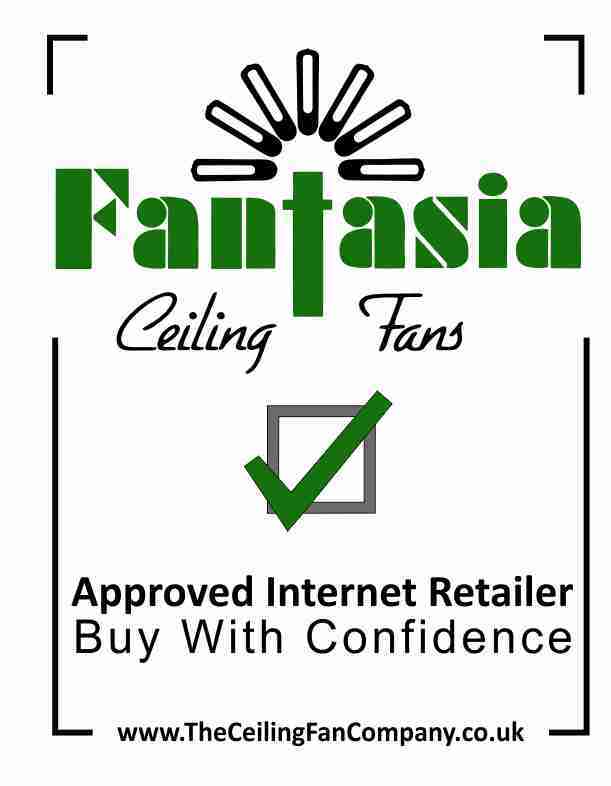 All fans are covered by Fantasia Fans' motor warranty - 15 years for Elite range fans, 10 years for Fantasia Range, 5 years for EuroFans range and 2 years for remote controls (see individual products descriptions for full warranty details). We offer a 14 day no questions asked money back guarantee. You must inform us in writing within 14 days of delivery of any goods to be returned, any shortages, or if you wish to return any damaged goods. The date of delivery will be as recorded by our couriers. Unwanted items must not have been electrically installed, unpackaged or tampered with. Once we have your request for a return our customer services will give you an authorisation number. Goods returned without a returns authorisation number will not be accepted. All goods must be returned in their original packaging, complete with all other associated components sent with them such light bulbs. Goods should not have been installed, modified or used in any way and should be in an undamaged condition. Unwanted goods are returned at the customers' cost.